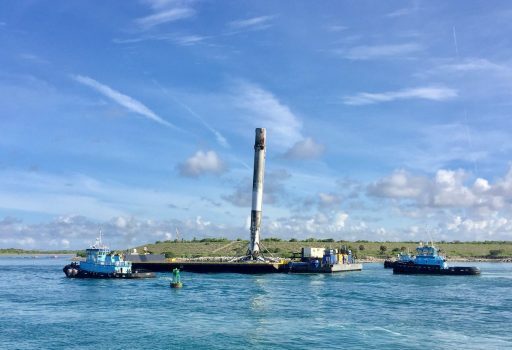 Badly bruised but still standing, SpaceX’s Falcon 9 first stage from last week’s high-energy delivery with Bulgaria’s first telecommunications satellite pulled into Port Canaveral on Thursday, six days after managing to survive the most challenging Drone Ship Landing to date. Sporting plenty of battle scars, Booster 1029 is SpaceX’s second first stage to be recovered after making a second trip to the edge of space and back. The return of the East Coast Drone Ship ‘Of Course I Still Love You’ was the second SpaceX booster to return to shore in a 24-hour period after ‘Just Read The Instructions’ brought back the Iridium-2 booster that had enjoyed a more gentle re-entry but had to deal with challenging weather conditions in the Pacific when making its return last Sunday. 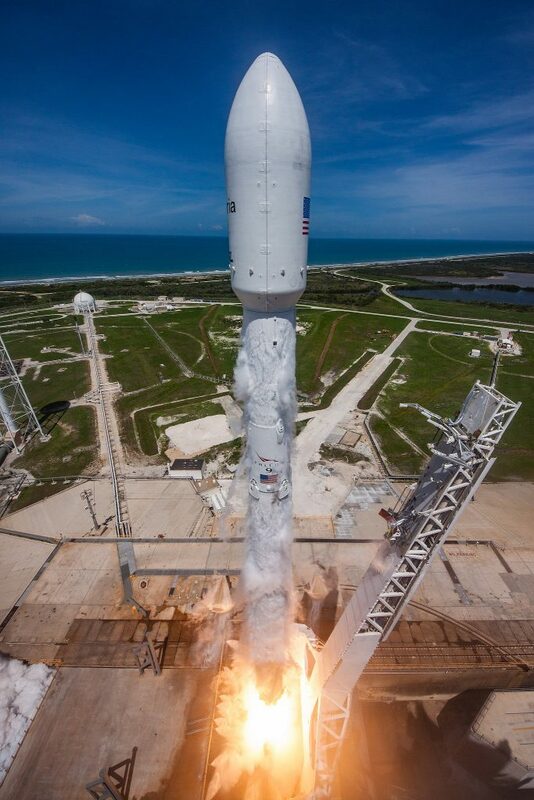 The second round trip for Booster 1029 started at 19:10 UTC on Friday when Falcon 9 thundered off from Launch Complex 39A at the Kennedy Space Center, embarking on SpaceX’s fourth Geotransfer mission of the year, aiming for a particularly high-energy Supersynchronous Transfer Orbit peaking 65,000 Kilometers above the planet. 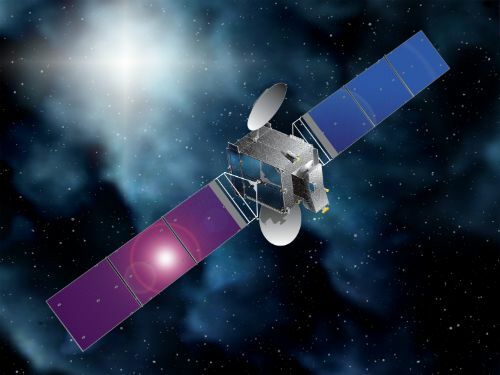 Delivering the 3,669-Kilogram BulgariaSat-1 to this high-energy destination left the first stage with a minimum of leftover propellant for the powered return to the Autonomous Spaceport Drone Ship. The first stage was in charge of powered flight for two minutes and 38 seconds, boosting the rocket’s speed to 2.36 Kilometers per second or nearly seven times the speed of sound. Parting ways four seconds after MECO, the second stage fired up on the first of two burns to deliver BulgariaSat-1 while the first stage continued on a ballistic arc as no boost back maneuver was possible for this particularly fuel-constrained mission. This required the OCISLY Drone Ship to be moved out to a distance of 680 Kilometers to the launch site, precisely holding position for the arrival of the booster. 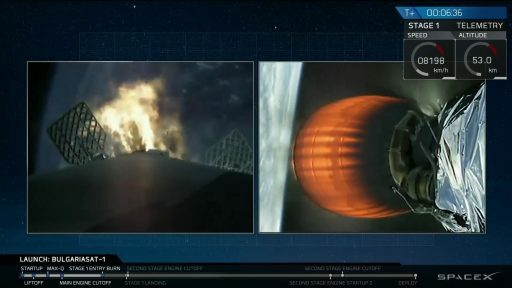 Prior to launch, SpaceX Chief Elon Musk Tweeted there was a good chance the booster would not make it back because Falcon 9 was expected to “experience its highest ever reentry force and heat.” As pointed out before, kinetic energy increases as a square of velocity and peak heating as the cube – explaining why even a slightly higher MECO velocity/entry speed will have a considerable effect on the difficulty of the stage’s return journey, not even taking into account the decreased propellant supply that arises from a higher MECO target. The first stage used its cold gas thrusters to maneuver into an engines first position and reached a speed of 2.39 Kilometers per second when firing up on its re-entry burn, passing through 59 Kilometers in altitude, six minutes and 30 seconds after lifting off. The 19-second entry burn slowed the vehicle by 560 meters per second. The rigors of the re-entry process became evident immediately after entry burn shutdown, with the stage descending through 40 Kilometers and pitching up slightly for the peak heating portion of re-entry. 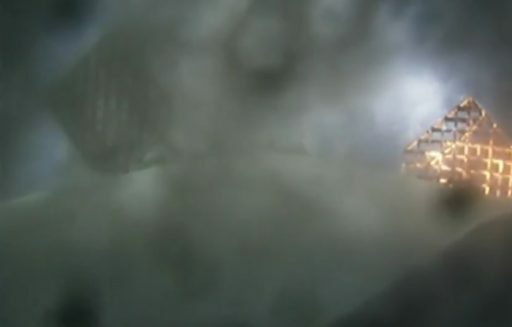 The onboard camera view became partially obstructed as heat shield material was liberated from the engine section & grid fins and deposited onto the camera, but the video clearly showed one of the two grid fins in view glowing brighter than on any mission before. Then video cut out altogether. Contrary to expectations, the first stage managed to survive its high-energy re-entry and entered a minute-long descent through the atmosphere, using what was left of the grid fins to steer toward the drone ship to fight its last battle – a daring three-engine landing burn in use for missions that do not have enough propellant for a single-engine burn that allows for more time for corrections but comes with greater gravity losses (i.e. fuel expenditure). The plan called for lighting up three engines to slow down rapidly, then cut to one engine for the final landing maneuver with the four landing legs deploying in the last seconds of descent. 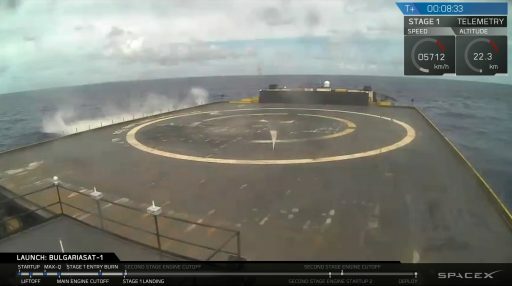 Video from the Drone Ship showed the engine plume hitting the water at quite some distance to the ship, indicating Falcon 9 had some significant lateral offset just before touchdown. Video then cut out and when it returned showed a badly bruised and potentially leaning booster standing on the outermost of the two circles on the drone ship deck – leaving the last-second correction maneuver up to the viewer’s imagination. As confirmed by Thursday’s return to port, this was the first mission to employ what has affectionately become known as the ‘Roomba’ or ‘OctoGrabber’ – a remote-controlled contraption that can move about the Drone Ship deck to be placed under a landed booster to secure it after landing via its hold-downs without the need for personnel to get near a potentially unstable vehicle. 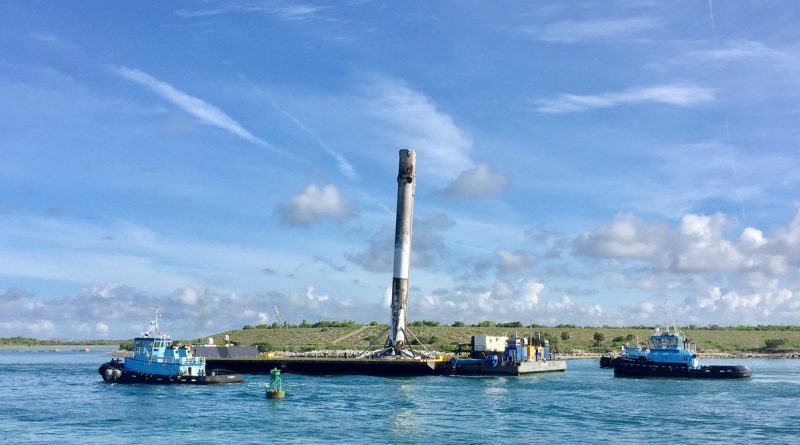 SpaceX has yet to officially acknowledge the system’s name, but Thursday’s return confirmed the ‘Roomba’ was used to secure the 47-meter tall booster. The cause of the last-second lateral deviation had caught interest among observers and SpaceX engineers. 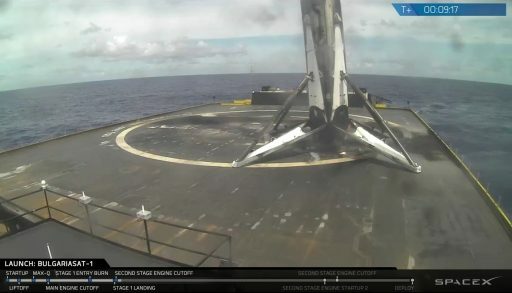 Musk said on Twitter Falcon 9 used up almost all its crush core capability within its landing legs to cushion a hard touchdown after being slammed sideways during final descent – either caused by a strong gust of wind or an onboard malfunction. SpaceX was reviewing video and telemetry to determine what caused the sudden lateral motion. Tied down on deck, the booster started a lengthy trek back to shore. The Drone Ship pulled into Port Canaveral Thursday morning, local time, docking at around 9 a.m.. Photos of the booster’s return clearly showed its ‘extra-toasty’ condition – particularly upstream of the grid fins where a mix of SPAM thermal protection and oxidized aluminum deposited as the fins slowly burned away during the high-energy entry. 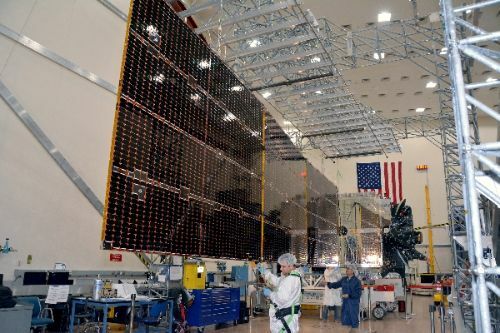 The new titanium grid fins that debuted on Sunday’s Iridium-2 mission will be able to withstand even high-energy re-entry with ease, requiring no refurbishment between flights and also providing greater control authority as a result of their larger cross sectional area. Photos also confirmed the booster was leaning to one side as a result of the crush cores being compressed. Operations to lift the booster from the Drone Ship began shortly after its arrival and will be followed by safing of the booster by draining any remaining fuel and igniter fluid, removing the legs and rotating the booster horizontal for transport to a preliminary holding facility, most likely near LZ-1. Booster 1029 is the first to fly from both coasts of the United States, making its first trip in January with the first ten Iridium-NEXT satellites before completing six months of refurbishment that included the replacement of a number of components with upgraded versions that will become standard for Falcon 9 FT Block 4 and 5 vehicles. Now returned for the second time, B1029 joins B1021 that lifted the Dragon SpX-8 mission in 2016 and became the first flight-proven booster to take to the skies again, carrying SES-10 towards orbit on March 30.